First thing I would try is go into the Settings of the VM GUEST that has problems and make sure the Network Adapter is configured to use a valid network. 5 - Does VM Start? If that doesn't work, Remove the Network Adapter(s) from the VM then Add a new Adapter. Ok. You were right, on both VM's the Network card was messed up. Once I set them back to the correct network card, they boot just fine. The problem now is they no longer have any Network connectivity. I assume this is because the VM additions on the VM's are not compatible with the RTM code on the host. Thoughts about how-to get rtm code installed on the VM's with no network? Always upgrade your Guest VM's with the latest VM Additions / Integration Components BEFORE you upgrade the host. This has been my rule of thumb since the beginning of Microsoft Hyper-V and it has always kept me from running into driver/guest virtual server issues. Your problem has a simple fix. All you need to do is Add a Legacy Network Adapter to each of your Virtual Machine Guest systems. After reboot they should have network connectivity and you can either Download the drivers manually or get them from Windows Update. 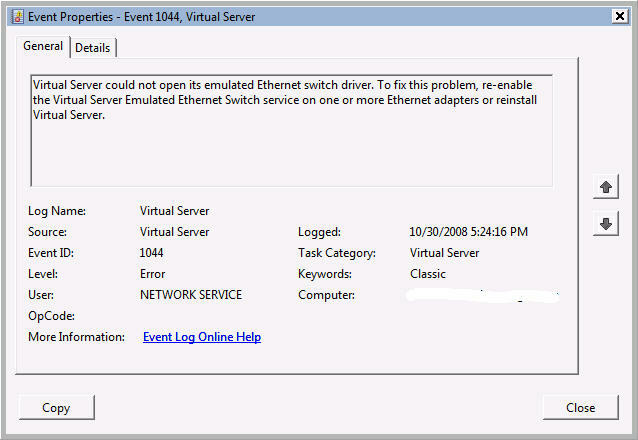 The Update your looking for is the RTM Hyper-V code - KB950050 that is if your VM's are running Server 2008. Be sure to grab the right Update (32bit Vs. x64). But like I said, the easiest way is to just hit Windows Update and let the website grab the files. Now, if there's a "rare" issue where the Legacy driver doesnt work, you can also download the update to a CD/DVD and present it to the VM. Another option is to create an ISO of the update and present that to the Virtual Machine. Both work. Hope this gets you what you need! Be aware, http://www.microsoftpost.com/tag/hyper-v/ is a great link for watching the latest files available for Hyper-V. It's updated every hour and contains all updates from Microsoft Download. Yes, it's a Server 2008 VM and once I added the Legacy adapter, I had network connectivity and Windows Update offered me the update. Installed it, turned off the VM, removed the legacy adapter, boot the VM and I was back in business!!! Thnx. Looking back this was pretty simple. I probably could have figured it out but i appreciate it! i have installed Windows server 2012 and Hyper-V role on it. i have successfully created 5 instance (VM's) on it. 2 for windows 2008 server and 2 for Centos and 1 for Ubuntu. i have exported centos 32 bit VM and import to another VM using copiy and create new unique ID. with legacy network adaptor. it worked fine. however now, when i installed centos 64 bit 6.4 version. it automatically selected network virtual switch. i exported this VM and imported on new VM. MAC of both VM is same. so that i can not enter in the network. MAC pooling is set to dynamic. but nothing happened still both VM's MAC is same. can you help me to find any workaround as early as possible.